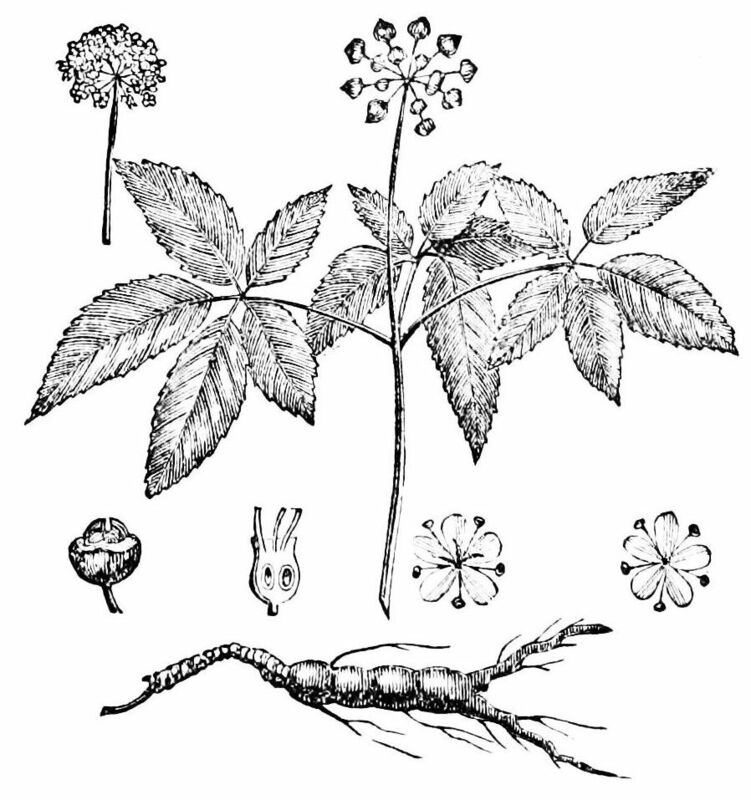 Ginseng is a plant that has been known for its medicinal benefits since antiquity. It’s not only prized for supporting healthy blood pressure, but as a heart tonic, an aphrodisiac and a guard against evil in general. Ginseng is found in both China and North America. Both types of ginseng are members of the Panax species. In North America, ginseng is considered endangered because it’s been overharvested from the wild. The plant prefers moist, rich soil and is partial to shady, north-facing slopes. Some herbalists grow their own ginseng, but it’s a hard plant to grow. The seeds are tough and need to be softened before they germinate. In the wild, this happens when birds eat the ginseng berries, and the seeds are softened by the hydrochloric acid in the bird’s stomach before they pass through the rest of the digestive system. Herbalists mimic this by soaking the seeds in one part bleach and nine parts water for about 10 minutes. The seeds are then rinsed. Ginseng seeds are sown in the fall and then take anywhere from eight months to two years before they finally germinate. Ginseng needs lots of space and seedlings should be planted at least five feet apart. They also need to be well-shaded. Even if a gardener can finally get the ginseng to sprout, it still takes about seven or eight years for the root to be ready for use. Nine years seems to be the optimal time to harvest the root, and the older the root is the more potent its effects. Ginseng makes up for its long germination and maturation time by having a long life if it’s well-cared for. It’s not unusual to find ginseng plants that are 400 years old. Some people prefer fresh ginseng root because they claim it’s more potent. Ginseng root can be stored in ways that preserve its potency. In Asia, the root is cleaned, put in a basket and then put in an earthenware steamer with a lid. The steamer is then put over an iron pot full of boiling water that’s been infused with the bark of a plant called woo. Woo is supposed to help the ginseng root retain its medicinal properties. After about four hours, the roots are dried over a wood fire or in a drying house. After a week they turn deep red. But an ordinary gardener can simply wash the roots and dry them on a screen in the sun. It takes about one to two weeks for ginseng root to dry thoroughly. After that, it can be stored in a jar. Ginseng contains chemicals known as ginsenosides, which are known for their anti-stress properties. Interestingly, there are indications that ginseng taken at lower doses can cause low blood pressure to rise. However, when it’s taken at higher doses it can cause high blood pressure to fall. These results can lead to the conclusion that ginseng normalizes blood pressure. Many people who have low blood pressure believe that their condition isn’t much of a problem, especially when they hear about the devastating effects of blood pressure that’s too high. But blood pressure that’s too low can also be a sign that something isn’t right. The person may be suffering from anemia or an infection. Low blood pressure can cause a person to feel dizzy just from the act of getting out of a chair and may also cause him or her to feel tired all the time. To correct low blood pressure, a person may take a tincture made from ginseng and other herbs that normalize the blood pressure. The ingredients are simply a half a teaspoon of the tinctures of ginseng, hawthorn flowers and berries, ginger and rosemary. They should be blended in a dark bottle and a dropperful should be taken two to four times a day. Of course, anyone who’s suffering from any type of blood pressure problem should check with his or her physician first.